The idea for an Olaf stuffie came from a quick random survey I asked on Facebook (Like my page if you want to participate in the randomness! ), but really, after the initial idea came out, the whole thing just snowballed. Yup, pun intended of course! 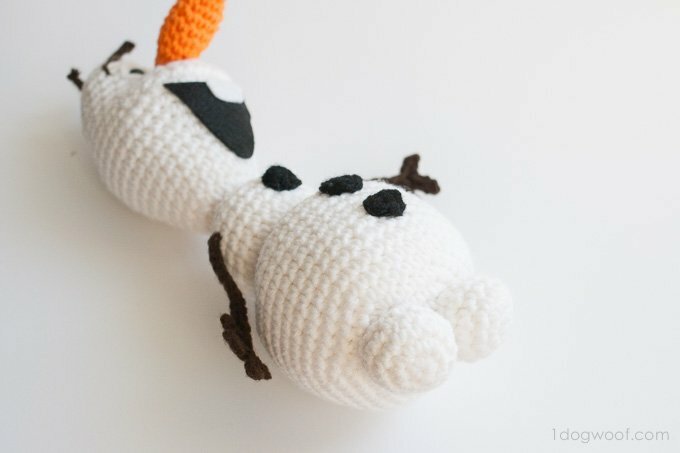 After days of scrolling through Olaf pictures and drawing out Olaf sketches and watching Frozen * one too many times, I’m pretty dang proud of my Frozen’s Olaf crochet amigurumi so I hope you like it too! A few of my readers have been kind enough to translate this pattern into different languages. You can find the following translations here! The hardest part about this project was the head. DUH. There’s just something about they way his nose sits on the continental shelf of his lip. Seriously, the shaping of it just boggled my mind for days. I even made a first draft of a head but ended up not using it. But once the head was complete, everything else sort of fell into place. worsted weight yarn in white, orange and brown. I used yarn from my stash and no longer know what brand it is. I do not have a pattern for the nose, only basic guidelines. It was “free crochet” and done on the fly since it was so small and the tube was so tight. I am only providing guidelines on how to assemble his body parts. Always leave a long tail so you can sew the different parts together. I liked sewing the parts together at rounds 5 or 6 to give him a more squashy look, but since Olaf can be assembled in a million different ways depending on his mood and what you want him to be doing, this exercise is really left up to the reader. The eyes are white felt pieces cut into 3/4″ circles, with small holes cut slightly off center and a safety eye pushed through the hole. The safety eye + felt is then “installed” centered between rounds 19 and 20 of the head piece. Once I’m done using the end tails to assemble or secure the pieces, I sew directly into and out the back of the stuffed piece I’m working on so the yarn is pulled into the stuffing. When I pull the needle out and cut the yarn, the end sort of shrinks back into the stuffing. The parts are worked in continuous rounds. (Install safety eyes between rounds 19 and 20). Close off using this technique and weave in ends. Close off, leaving a long tail for assembly. Work 6 sc in magic circle (or free crochet into magic circle). Fasten off, leaving a long end to sew onto bodies. With yarn already attached to hook (and leaving a slight tail), insert hook through a stitch in the Upper Body and complete a slip stitch. Chain 13. In second chain from hook, slip stitch in next 2 stitches. Chain 4. In second chain from hook, slip stitch in next 3 stitches. Chain 3. In second chain from hook, slip stitch in next 2 stitches. Work slip stitches in each stitch back to the base of the arm. Fasten off and leave a bit of yarn. Tie the two tails (beginning tail and end tail) to better secure the arm and stuff the ends into the body. The instructions are the same for both hands, so one hand might look wonky, c’est la vie. 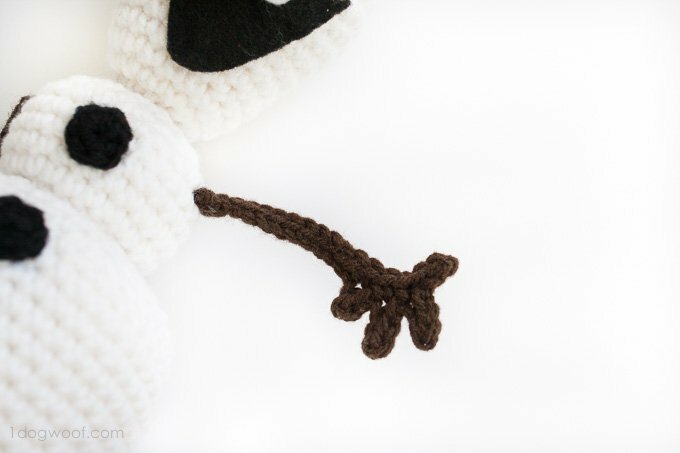 With yarn already attached to hook, insert hook through a stitch at the top of the Head and complete a slip stitch. Chain 3, 4 or 5 stitches depending on length of “hair” desired. Fasten off and cut yarn. Using the tapestry needle and a length of brown yarn, embroider the eyebrows over the eyes. The mouth you can free cut out of black felt, with an additional piece of white felt for the tooth. You can cut the mouth shape any way you’d like, or skip it altogether if Olaf has his mouth closed. The tooth is always visible and is rounded at the bottom. These pieces are hot-glued onto the head piece. This project has lots of pieces and the directions are completely based on my own experience (obviously). If you have questions or suggestions on how I can make the instructions clearer, please let me know in the comments sections below! Your Olaf is spot on! Love your attention to detail! You’re all kinds of awesome! 😀 We’ll all be saying, “Oh.. I’ve been impaled!” every time the crochet hook goes through. HA HA! Too funny! I agree, it’s the comment of the day! Even more than the words he says, I love his giggles 🙂 Thanks for the pin, and the love Kristin! I’m not sure I understand the question. Please look through the other comments and see if that helps you. when doing round 16 just do what it says….it will make since after you finish……shapes his mouth….will post mine when done…..MY 20 month old granddaughter is crazy on love with any and everything OLAF..working on a quilt and dress also ! When it says, “One dc in the next 6 st,” it means put one dc in EACH of the next six st.
how tall is the finished Olaf? Thank you so much for posting this pattern. My son was just asking me to make Olaf yesterday! Thank you so much for this pattern! I have looked and looked for olaf patterns and they are all just freaky lol! This one is spot on! Fabulous job! Thank you, you’re too funny! Thank you! 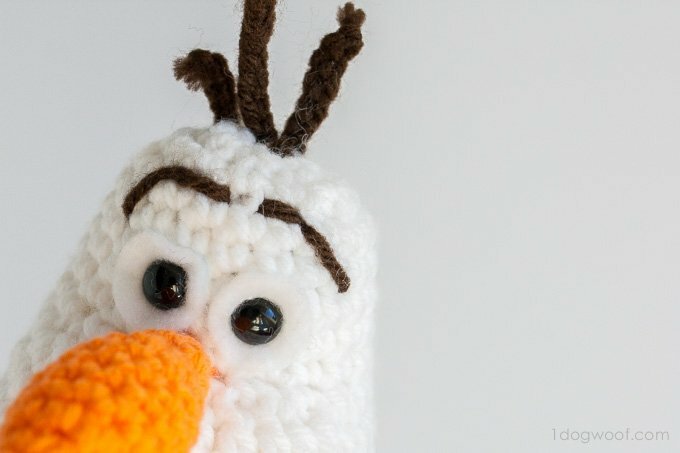 My daughter adores Olaf, and I was not able to find a pattern that truly looked like him until yours. The others are a little bizarre looking. You are quite talented. Blessings. Ha, thank you Robin! I think he’s a character that can be very open to interpretation and there’s a lot of love for him everywhere! As already mentioned, your attention to detail and scale is spot on. I can’t say enough good about the quality of your recreation of him. I’m so touched by your comment Debbie! It feels awesome to know that you appreciate the thought that went into this project. I spent a TON of time staring at pictures and working on the shape of his head and the general proportions of the different pieces, so I’m so glad you (and everyone else) recognize the work. Thank you so much! Ah hahaha! This is so cute. Love it! Best Olaf pattern I’ve found! You are very talented! Any tips for beginners on reading patterns? I am self taught and only learn patterns by watching videos. I also learned by reading books and poring over illustrations. My best recommendation is to go slow and take it one stitch at a time. Good luck! I’m so so glad she’ll find some joy in your present, and what a wonderful friend you are! Thank you for sharing your story! This is one of the best, if not THE best, Olaf’s I’ve seen! My daughter is crazy about Olaf so I think I just found one of her Christmas presents! Thank you so much for sharing!! I have made a PDF of it for you if you’d like. Now to get my hooks out and start making him! Wow, Debbie, thank you for the extra work! I haven’t decided if I will be distributing a PDF, so I do ask that you hold on to your PDF for yourself for now. I will post about it once I make a decision! Thank you for the feedback Wendy! It’s something I’m considering doing, but I haven’t fully decided whether to offer it yet. I’ll definitely post about it once I make a decision! So cute!! How tall is Olaf when finish? Finally! An Olav Amigurumi that looks EXACTLY like Olav!!! Nicely done! Can’t wait to make this! Thank you! Hey Lisa. Let’s go through it slowly. “Work 1 sc in next stitch, 1 sc2tog, 1 sc in next 7 st, 1 sc3tog, 2 sc2tog, 1 hdc2tog, 4 dc2tog, 1 hdc2tog, 2 sc2tog, 1 sc3tog, 1 sc in next 7 st, 1 sc2tog, 1 sc in last st.” You should have 46 st from the previous row, and you’re shrinking those 46 stitches down to 30 stitches. The first parts of the line should be straight forward. 1 sc, then sc the next 2 st together. Then you’ll sc in the next 7 stitches. Then, take the next 3 and sc them together. Then, sc 2 stitches together, and then do it again. Take the next 2 stitches and hdc them together. Then you’ll dc together the next 2 stitches, and do that 3 more times (for a total of 4 dc2tog). At this point, you’ll then be repeating what you did, but backwards to create symmetry. Does that make sense? Thank you so much for explaining on how to do those stitches! I usually go to youtube to watch people crochet certain stitches but I couldn’t find anything on there for these. You’re explanation helped me tons! 😀 I’m making this for my 1 year old daughter. She loves Olaf. Thanks! I’ll have to update my pattern with the descriptions. I actually have descriptions in my Mary Jane pattern, so just need to update this one as well. I’m sorry but I do not have videos available. You may want to do a google search on sc2tog to find a video for this technique. Wow i,m glad Lisa asked the question i had i found row 15 difficult thank you for explaining. 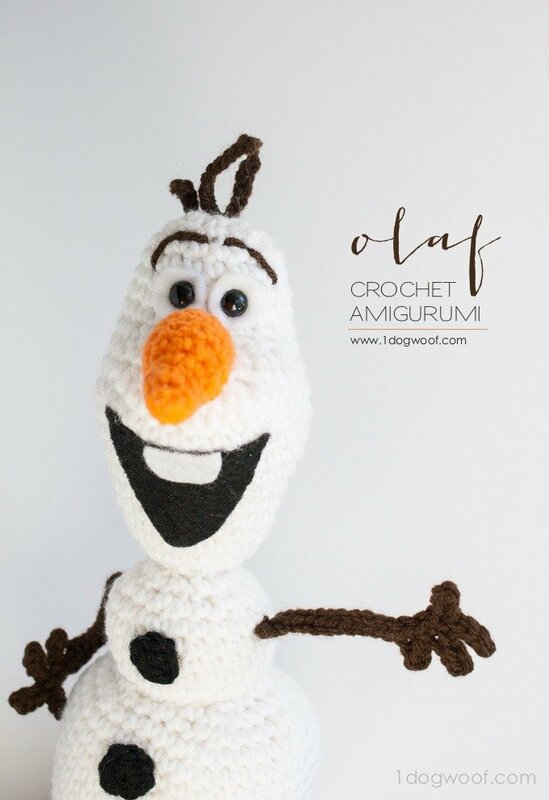 Thank you so much, ChiWei, for creating & sharing this ADORABLE Olaf pattern! 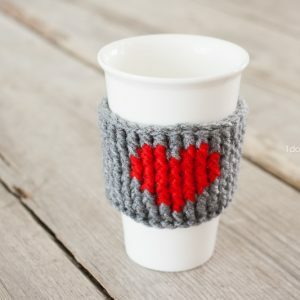 You are amazingly talented, & I love that you’ve generously made this a FREE pattern. Hugs & Blessings, From Gina in Beautiful SW Oregon. Completely agree with Gina. Couldn’t have found better words of appreciation and gratitude. Sharing is a gift not given to everybody. Thank you sooooo much ChiWei and congrats on your talent. You really got Olaf there. Mass produced this little cutie and you’ll be rich! Well, you’re right. But who knows, maybe you can get licensing or permission from Disney Enterprises and maybe they’ll give you one. I have a question for you. I’m just starting on the head and I have noticed that there is no mention of joining with a slip stitch and then doing a chain 1 to start the next row. Am I missing something, or is that something that is not needed on the pattern? Thanks so much for sharing your hard work! Thank you again for such a fun project! Oooh, I’m so glad you finished the head! The hardest part is over 🙂 And great job on learning new techniques and pushing yourself to new heights! I Started OlAF yesterday and finished him today, your pattern is by far the best and spot on. Just wish l New how to upload a photo for you. Thankyou for sharing. love this. gonna try to make for my granddaughter for Christmas. Guess who is going to crochet an Olaf today?? Yay. Thank you very much for the pattern. He is gorgeous and you are brilliant! I left a PM on your FB page. I have questions in regard to your Olaf instructions. Thank you. So cute! Your Olaf is very good. What type of yarn is this (cotton, wool…)? I’m a beginner and I don’t think I can resist attempting this. Thank you! I used plain white acrylic yarn for all the pieces. I’m enjoying making Olaf. My daughter sent the pattern for me for my grandchild who is 5. Thanks for clarifying the 15th row, although I was somewhat on the right track. I rewrote it for myself: Work 1sc in next st., sc2tog-1x, l sc in next 7 sts, sc3tog-1x, sc2tog-2x, hdc2tog-1x, dc2tog-4x, …and so on. Also, I slip a threaded tapestry needle through the “sc in the next st” as it helps me to keep count. A bobby pin will work too. Thanks for a lovely pattern; and do I ever appreciate all your thought, effort, and planning that went into this piece of work. Thanks for the clarification Anna; I’m sure there are others who will find your style more clear. I hope your grandchild loves your creation! Thnx so much for posting your pattern. It’s the best Olaf I have seen yet. I am making this for my nephew for Xmas. I just wanted to clarify, when working the rounds for the head you state 6 times….. I worked the 18 and the next row states 18 as well…… What do you mean by 6times? I worked the round six times around and it didn’t look right so I disassembled. Round 15 has been popular, I read it did it and messed up. I pulled out the stitches back to round 13 having 36 stitches….then I worked Round 14 I did everything and came out with 45 stitches not 46…..I took it back to Round 13 did it again and came out the same so I took it as a miscount or somewhere I missed a stitch. Any way on to round 15….made it there and followed the instructions you gave Lisa and I came out with 2 single stitches at the end but those two stitches worked came out to 30…..so all in all something I’m doing is not right and as I said I am careful when counting and moving the marker ect…has anyone else have this happen two??? It still looks good I am very pleased and grateful for the Olaf pattern and for you posting it. It is awesome and your response is wonderful too. Can hardly wait to see your finished pattern in PDF or revised….glad everyone is helping. Hi ChiWei! I want to say congratulations for your job, it’s amazing!. I made a translation to spanish of your pattern. I post in my page on facebook. I think it can be interesting for the people who speaks in spanish. You can see it, and if you think I have to erase it, you only tell it to me and I will do it. Thank you for your job again. And for your blog too. I hope you like it. I’ve a lot of crafts on it. I’ll be trying this for my 6 yr. old daughter. She just walked by as I was looking at this page and squealed in delight. “I need that Olaf, Mommy.” she said. Thanks for sharing this cute pattern. Oh , he is so cute and so spot on. I wish I could crochet, but I have trouble with the pattern directions. I have tried to learn, but I get mixed up. I am having an Olaf sleep over for my two grandsons on December 6. I am making Olaf pajamas for them and wish I could make Olaf. I hope to start a holiday tradition where each year we have a special holiday sleepover with a theme. That is my plan. Thank you Bonnie! The themed sleepover sounds like a great idea! 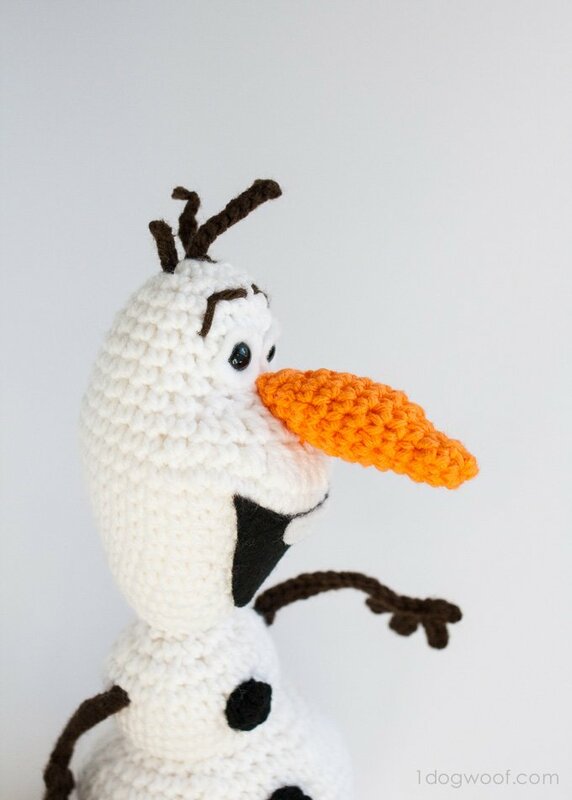 I so wish I could crochet…this Olaf to just so darn CUTE!…perfection! I am thinking I may ask someone I know who DOES crochet to make 2…1 for my grandson (6 moths old) and the other for ME! I just LOVE Olaf!! If there’s one thing I appreciate..is someone that will go to great lengths to make something so Spot On…this is talent magnified! Thank you Chi Wei! Thank you so much for your sweet comment! I’m really happy that everyone appreciates the detail in this pattern, and I’m still pretty darn happy with how the shaping came out, lol! I hope you get one for Christmas! I LOVE LOVE LOVE this pattern! I have made one already, didn’t take long at ALL, and going to make another one in just a bit!! I will share a pic to your Facebook Page SOON!!!! Thanks again for a GREAT pattern!!! Yeah, I was pretty happy that once the head was made, the rest of it came together pretty quickly. I’m glad you enjoy it! Thank you so much for this pattern. I will try to translate it into french ! I’m sorry, I can’t help without seeing it. The pattern is worked from the bottom of the head to the top. I figured out what I did wrong, lol. I am assembling him now and crocheting his nose. Awesome pattern!!! thanks so much for this pattern! I will be using as Christmas gifts for my 3 nieces! I just finished with the head (crocheting) and I’m so excited to finish the rest! The pattern is so easy to follow! Thanks again! Happy holidays! I finished the pattern and I love it! I made mine with a j hook so he is about 13.5 inches! With more practice he will be as good as yours! I crocheted the mouth and eyes instead of felt! Anyways thanks again! Ooh, Olaf as an elf on the shelf? What a great idea! Hey Ladies ,(oops and Gents if any) Did you know the original Elf on the Shelf came out in the early 70’s and came in three colors-Squash yellow, Olive green, and of course Red. Their arms were closed together and their knees bent up into their chest. Oops I am telling my age now! Thank you so much for this pattern!! I just made it and it was perfectly clear. Thank you for such a cute pattern, I am attempting to make one for my daughters niece. Can you please clarify, do I keep crocheting in rounds or do I slip stitch the row together and chain one to start the next row? Thank you for your time. I chose to crochet continuously in rounds, but this pattern should work if you end each round with a slip stitch too. My first attempt was worked in individual rounds so I could keep track of stitches, and then I re-made it in continuous rounds to eliminate the seam. Hope that helps! Thank You, I choose to work this pattern in continuous rounds, and used a small safety pin to mark the rows, so I could make sure my stitch count was correct. Heel leuk patroon! ik heb echter wel een vraagje (het kan misschien dom klinken :p) maar waar staan de afkortingen 2 sc2tog, 1 hdc2tog, 4 dc2tog, 1 hdc2tog, 2 sc2tog, 1 sc3tog voor? They are “single crochet 2 together”, “half double crochet 2 together”, “double crochet 2 together”. They are decreasing stitches. Thank you so much for the pattern ! I will offer it to a friend and soon you’ll be able to see it on my blog (I will note a link to your blog) ! I was wondering if it would be OK for me to translate this pattern into Swedish and post it on my blogg? With a link too your original pattern of course. Hi ChiWei! I would like to take this time to say thank you for your designs for the Blog Hop CAL. I really enjoyed it. I’m looking forward to doing more in the future. 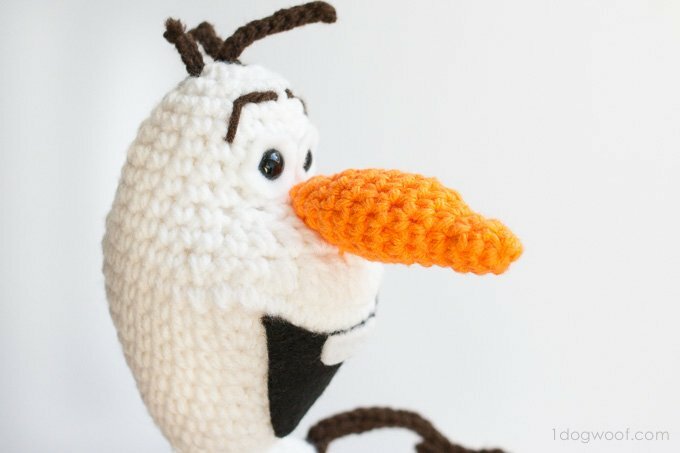 I really love your Olaf and was wondering if you have a design using him in a Lovey Blanket? I’ve never made one before and wasn’t sure how to as far as attaching the head or continuing an afghan from the head. I look forward to hearing from you. Thank you! I’m sorry, I don’t have experience making lovey blankets. But I’d guess that you make the head individually and attach it directly to a small afghan? Thanks! Hi! I’m trying to make this and was a little confused on how the head, upper body and lower body are attached to each other. Your Olaf looks just like the one in the movie! Thanks! Thanks Jessica! I squished the parts together and sewed them together with a whip stitch. Wow! This is stunning, you’re such an amazing artist, thank you very much for the pattern! I’ve come up with a pretty good pattern for the nose. Thank you, thank you, thank you!!! This nose was giving me so much trouble! I even tried someone else’s pattern for it and it didn’t look right. I really appreciate you taking the time to post this pattern that actually looks like the right nose! THANKS!!! Any way you can put a printable template of tooth and mouth,Lol not a very good artists and yours looks great. I made this olaf last night, everybody loves it. You nailed his features just right. That’s not easy, trust me I tried, several times! This pattern is amazing, thank you so much for sharing it with everyone. I just know I am going to end making loads of these, all my family and friends want one. Thank you! His features are so simple, yet really hard to duplicate right? So glad your family loves them! Your Olaf is great! I’m assembling mine but he won’t stay standing- was that a problem with yours??? Or did I over stuff the head and nose??? Thanks for your design. I will forward a pic as soon as I have finished. Yup, he won’t stand up on his own, so you are ok. I totally overstuffed mine, but he is definitely top heavy. Merci beaucoup beaucoup !!! – Huge thanks ! 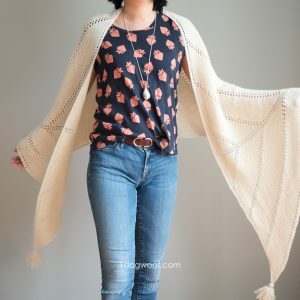 I just shared the link to your pattern on my blog, translating the “Abreviations” part, so that french readers a bit shy with english pattern can have a try. My two little princesses and their brother can’t wait to have Olaf at home, perfect gift just after Christmas… Thanks again ! Your pattern writing is great. The one suggestion I’d make is for you to possibly indicate, for the head, that one is starting at the bottom of the head and working up. Great point, and thank you! Hello, thanks so much for this pattern. I finished Olaf today and he has come out really well. You are very talented. Hi! thanks a lot for this pattern. I had a problem with the arms. I couldn’t do it! 🙁 do you have a video or something…? For the arms, it’s a chain then worked back on itself. It’s kind of like drawing a handprint around your hand – go up one side, do the individual fingers and then come back down the other side. I love your website and Olaf. I tried to print him today so I could crochet him but even that went wrong. I got the instructions but no pictures. Maybe I did something wrong. I only wanted the pattern so I printed just the pages that it was on because if I had printed everything I would have gotten every ones comments, 33 pages total. The pattern is only 8 pages with pictures. I am going to try it one more time because the pictures really help. Keep up the great work! Tried a 2nd time but no luck so I will just use the computer to see the images when I crochet. It is weird I can print all the images on the side and top of the page just not Olaf images, on pages 1-9. Thank you very much for sharing the pattern! Itbturns out super adorable! Hi! We are late comers to the frozen frenzy but my two little boys are now completely obsessed! I’m over the moon you have provided your wonderful pattern for free, I’m just assembling my Olaf and he’s looking great. Thank you for such a detailed, well written pattern and all the time and effort you have put into it. It means I get to whip up a surprise for my children in no time at all so I’m very grateful. Hi, I’m from Argentina and I have just translated your pattern into spanish. You are a genious. Olaf really looks like the real one. I am doing it right now. The head is amazing. My little baby girl will enjoy it tremendously. I have to add my thanks along with all the others. This pattern is so amazing. The attention to detail, the head… all of it! And it was so kind of you to offer this as a free pattern. I appreciate your hard work and your sharing it with all of us. THANKS!!! This made my day! How wonderful is this!! 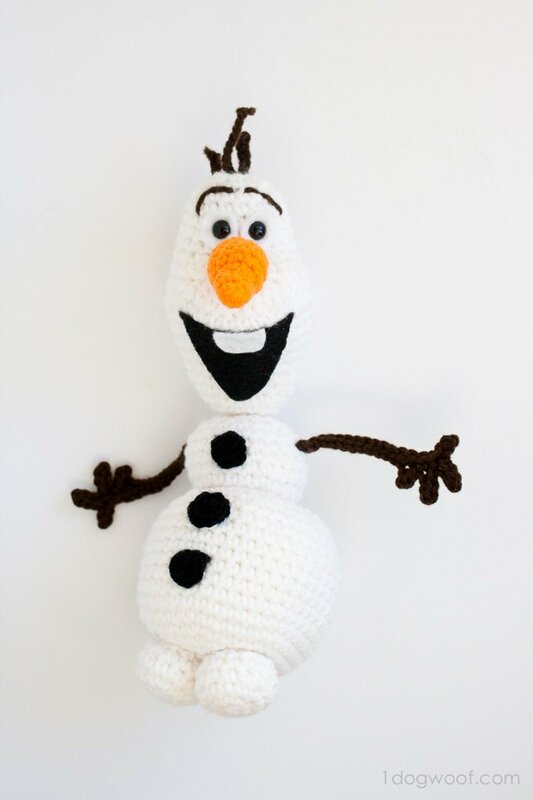 I am so excited to make this little Olaf. Thanks again. You are wonderful and talented. Hello I absolutely love this pattern and heres a pattern I made for his nose. I used a 4mm hook. Now fasten off and sew tip closed or sew on as is. Thank you so much for this pattern. I’m new to your website and I love it. I started crocheting to help with ptsd and anxiety. And you have great patterns I have been debating weather I want to do one of the patterns I enjoyed looking at but when I saw Olaf I made the decision to make this site my #1 must list. And I simply must try to make Olaf. Thanks for writing in Laurie, and I’m glad I can help with your decision making 🙂 Good luck and have fun! Heel hartelijk dank voor dit goede patroon van Olaf. Ik heb hem met heel veel plezier gemaakt. Het was een hele uitdaging om hem te vertalen in het Nederlands, maar hij is toch goed gelukt. Great work, thanks so much for this free Olaf pattern! I can tell that you’ve watched Frozen many times and spend a lot of time and effort on him. It really looks like the real thing! I am thinking of putting Olaf together with velcro strips so the parts can be removeable and poseable… I’ll let you know how it turns out. Now I’m going to look for you on Ravelry. Thanks Nicole! Yes, there was a lot of staring at stills and watching the movie with my kiddos. I had thought about the velcro but was afraid it’d pull the yarn and make it all fuzzy, so I’d love to see how it works for you! Hi Chi Wei, This is the most beautiful Olaf I have ever seen. My grandkids will love it for sure… since I have 5 granddaughters you can imagine what I have to work on…. 🙂 – Thank you for sharing! This is an amazing pattern! Very easy to follow. Just finished my version and can’t wait for my daughter to see it tomorrow morning!! Hi Chi Wei – I have made and unmade the head several times up to Row 16. I get row 15 done and have 30 stitches, but your stitch count by pattern only produces 26 (however pattern reads 28). I cannot then figure out how to decrease from 26 to 21. I have read through the pattern several times and cannot figure out how to get 28 stitches out of row 16. Could you please help?? Round 16 is 28 stitches, just like the pattern reads. 1 sc, 1 sc2tog, 7 sc, 2 hdc, 6 sc, 2 hdc, 7 sc, 1 sc2tog, 1 sc – that’s 28 stitches. Then, for round 17, you’re removing 7 stitches to get 21. Thank you for the clarification. I was reading 1 hdc in the next 2 stitches as a decrease. Thanks again! Can’t wait to finish this cute little fella. I appreciate your time in sharing this pattern. De la ronda 15 (30 puntos), no puedo pasar a la 16 (28 puntos), dado que el número de disminuciones afecta las proporciones. Cómo se hace? Hi. I would like a pattern for Olaf nose. Please I really need one. Thank you!!! I really appreciate if you put a pattern. Hi Maria, sorry I don’t have an exact pattern. I started with 3 sc in a magic circle, worked up to 4 stitches, 6 stitches, and I think up to 8 stitches before starting to decrease again. But since each round is so small, I didn’t bother with a stitch marker which is why I say to just make it up as you go. Approximately how tall does Olaf turn out when he’s done? He’s probably about a foot tall. Thanks for this pattern! I’ve made one for a little girl for her birthday and she LOVES it and one of her friends wants one too…. First of all Thank you for creating this AWSOME Olaf pattern! Secondly Thank you for posting it for free! I understand how much work was involved and am awestruck! You have created the best Olaf I have been able to find anywhere and I am really pleased to be able to give my children something so lovely. I can’t crochet myself, but my mother in law can, may I translate this into Danish? And if I may, would you like to have a copy? Thank you so much for this fabulous OLAF pattern! I’m probably going to crochet the mouth and eyes too, can’t wait to make it!!! You are awesome!!!! My grand daughter is going to love this! Hello! Your Olaf is absolutly amazing! I’ll make one to my daughters and another to my niece. Thank you very much. I want to ask if, after finishing the Olaf I can put a link to your page in my blog. Thanks very very much. Big hug . Hello I just love this pattern.my daughter and niece love Olaf. Ive taught myself to crochet and I don’t know what a magic circle is? Hi there ! I’m just crocheting your Olaf, but I’m a bit confused at the round 16 of the head ! At on moment we nedd to do “1 dc in next 6 sc” WTF ? I try to search on youtube how can I do that, then I make 1 “sc” in the next 6 sc, and it work ! Can you fix you pattern, please ? Thank a lot ! No, I don’t need to fix my pattern. “1 dc in next 6 st” is the same as “1 sc in next 6 st”, except it’s a double crochet instead of a single crochet. That’s what gives the head its shape. Thanks! Thank you for the pattern!!! <3 :)) I love it! Hi! I would just like to know if you could tell me how tall your Olaf is, approximately. Thanks! Daughter convinced me to learn to crochet with her and this was my first piece. Great pattern and you were right, that head was tricky. Took three tries even with the pattern. By the end I am even able to keep my stitches a consistent size. Keep up the good work. Thank you so much for the Olaf pattern! I can appreciate how much effort and skill went into it. Just finished it for my granddaughter to take to college in a few weeks. Once I turned the head right side up I had no problems with this! !Might be making it again as 3 other grands are drooling over him!! I love the Olaf pattern and have made 3 so far. I’ve had a couple of friends say they will pay me to make one for each of them but because of your request I’m not sure what to do. I’m thinking of just telling them to give me what they want even though I know it won’t cover the time it takes to make them, but it was fun making the first 3 as 1 went to my daughter and 2 went to 2 sisters who are good friends. I would love it if you could make a Sven pattern, you are way more talented than I am, I love finding patterns to make, but can’t do very well creating my own pattern. Honestly, selling is up to you. Olaf is a trademarked character and there are rules about selling trademarked merchandise, but I don’t know all the details. My statement is more so readers are made aware of the bigger picture before they make a decision for themselves. Thanks so much for a lovely an accurate Olaf pattern! However, I was wondering about the feet, you don’t close them off? Or is it just a mistake leaving that bit out of the pattern? The feet are closed off. It starts off as 6 stitches, and ends with 6 stitches. Thanks! There are so many comments to read through so this may have already been mentioned but are the row numbers right for where to attach the eyes. The way I look at it rows 19 and 20 are the neck. I just put them where it looked right to me. Anyway, this is a great pattern, easy to follow and thank you so much for sharing it with us. As long as it looks right to you, then it works! The count is starting from the bottom going up. Thanks for the reply….must have been too much birthday cake….I should have figured that out. It really is a great pattern and plenty of little ones will be happy to get Olaf. You are sooooooo talented! Thankyou,I am a grandma of a 3 year old girl and she loves Olaf. A great gift (from Lima,Peru). Lovely! Thanks for the pattern. Just have to start by saying, this is an incredible pattern. When I saw it I just had to try. I finished one and it turned out great! The only issue I have is with connecting the pieces. I just can’t seem to get a clean look. Must of the tutorials I’ve seen show the pieces being connected with one piece not finished off. Did you use thus method with yours? Or did you do like I did and kind of squish the pieces together and sew them up. Any tips would be greatly appreciated. Since I’ve done one and my kids have gone bonkers over it I am going to have to make three more. Next time around I am going try something different with the arms. I’m going to use a piece of brown pipe cleaner, poke it into the body and slip stitch around it up until the fingers making them poseable. I’m hoping it works out. Thanks again fur all the hard work you put into creating this pattern. Adorable!!! How big is the finished Olaf? Can I have your permission to translate it, please ? I can publish the translation on my blog if you have it, and you can point the members of your FB group to that post. Thank you for asking! You can email me the translation at [email protected]. This will be my first “ami”, I hope I’m not too ambitious! Do you stuff the feet?? I noticed instructions for stuffing for the other pieces…. This is my first “Ami”! Do you stuff the feet? Oh so so, so, happy you posted this pattern, my year and a half old granddaughter is going to love Olof!, started the head tonight thru round 19 and can already see he’s going to be what your pic looks like, I had to laugh at how happy he looks already even with out his eyes or mouth yet, thanks again for sharing and like the others have been saying “spot on”. Great job!!! I feel like a dancing Olof!!! ? Hello There! I’m not sure if I posted my last comment correctly, so here’s anther go at it! 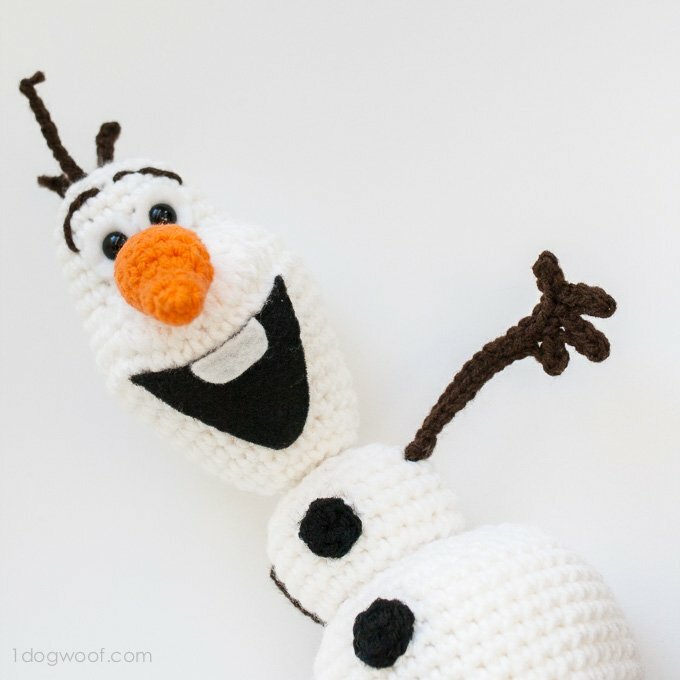 Your Olaf crochet pattern is wonderful and easy to follow! I’m starting my third one – for my third grandbaby! He’ll love it! I linked to my teeny, tiny blog at http://www.faithtrustandbreastcancer.blogspot.com/. Thank you for sharing! This is so good! Olaf is my favorite character. He’s so much fun! Im here just to say that you are amazing! 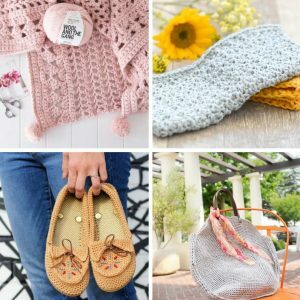 Thanks for all your beautiful crochet patterns! My niece is going to flip with this Olaf! Have a good day! Unfortunately, I don’t like any amigurumi pattern with DCs, let alone DC decreases. These leave gaps that makes stuffing visible. I can fix it obviously but I’d rather not have any problems in the first place. Thanks for the pattern though although it didn’t work for me. I made the unicorn for my 2 yr old granddaughter. And now am working in 2 Olafs for my great nieces that turn 4. Party is on Valentine’s Day! Almost done with making all the pieces. You directions are always so clear. And I love that I can turn to your creations for much needed gift ideas, knowing the quality is supurb! Thank you for your patterns!! HUGS! Thanks so much for the pattern – it was fun! Thank you so much for the Olaf pattern! My first Olaf.. is not perfect, but it is funny. Now I will make a second Olaf. I just want to thank you for your pattern.. I used an F hook and just regular 4 ply yarn it came out pretty big and huggable! I made one for my 7 year old niece, grandson & 1 for my grandsons auction basket for his 1st grade class! Thank you for sharing your pattern… You can whip one out in a night. The first one I had a hard time figuring it out but by the 2nd one I had it down … I made the mouth with felt and used fabric glue and safety eyes. What I like about Olaf it make a great giveaway for a boy or girl no matter how old they are! Thank you so much for all of the hard work and attention to detail that you put into this pattern! Thanks so much for this pattern, it’s awesome! My 4yo brother will absolutely love it! Just wondering if you’d be interested in a german translation of the pattern to put on your blog? Awesome Pattern I love it sooooooo much and want to say thank you for all your wonderful patterns! Love this it is so cute! Love Olaf!! Awesome job! Thank you very, very much for sharing the pattern and for all the effords you have made to create the lovely Olaf. I have made him for an 18 years old girl, who is so happy with hm. Hi Louise, I do not have print buttons on my patterns. You can print directly from the browser. Thanks! Hi! Can I ask how big this is? How tall? This is the best pattern for Olaf that I’ve found. Thanks for putting it out there for people. I’ve just started him, but I’m really excited to see how he comes out. I had just found this pattern and I worked it up. It turned out beautifully. My only issue is that I can not get it to stand on its own. I think I overstuffed my feet but I have a place where he can lean so it works out well. I may do another and less stuffing in the feet. Thank you for the pattern, this is a wonderful Olaf. My grandson is going to love it. Thank you so much for sharing this adorable pattern with the world!